Watercolor is everywhere right now! Tombow Dual Brush pens are awesome tools for creating watercolor pages in your art journal. Check out Torrie’s tips and tricks for blending Tombows and beating bleed through! Watercolor Art Journaling with Tombow Dual Brush Pens Hello again! 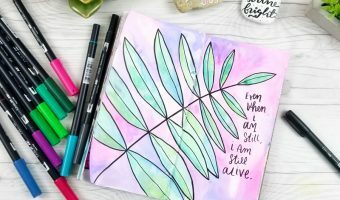 It’s Torrie again from Fox + Hazel, and I’m back with another fun … Continue reading Watercolor Art Journaling with Tombow Dual Brush Pens!